“Spill the tea, Michael C,” the e-retailer Made Au Gold writes in a recent Instagram post. “You get us 😏 ☕️ 🍿.” The product in question? 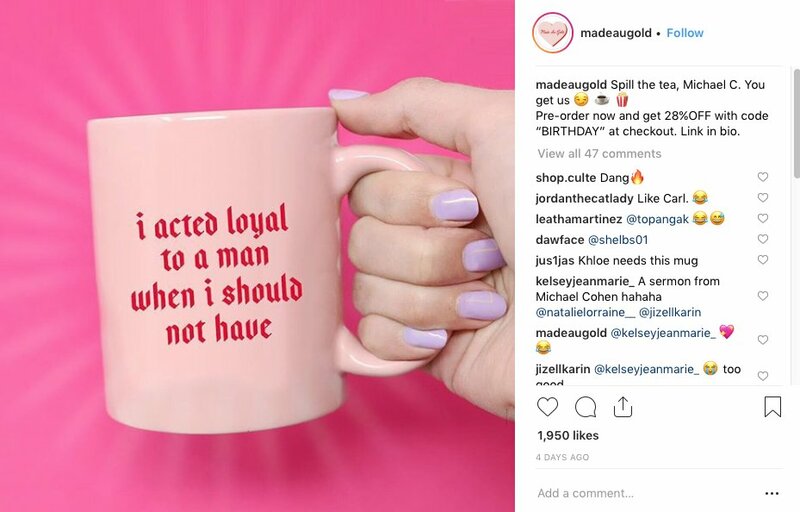 A pink mug with a quote from Cohen’s recent testimony before Congress: “I acted loyal to a man when I should not have.” Comments on the post were mostly some variant of “MOOD,” “THIS MUG,” or “I NEED THIS.” The cost of Cohen’s truth tea? Only $15. Indeed, there may be no clearer sign of the wild ride ahead in the remaining ten months of 2019 that Donald Trump’s former fixer, a man who says he “probably” threatened people more than 500 times on his ex-boss’s behalf, has become the subject of kitschy progressive merchandise.